LG will at CES in January 2014 introduce multiple monitors of series IPS 21:9. 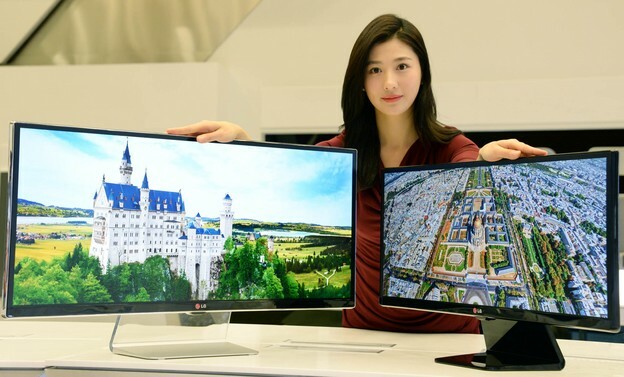 LG Electronics (LG) will at the upcoming International Consumer Electronics Show CES 2014 unveil its LG 34-inch UltraWide IPS 21:9 monitor (model UM95) which will be available in 29-inch version. LG says that UM95 monitor comes with a qHD resolution of 3440 x 1440 pixels. In addition to the model UM95 LG will showcase a model UM65 available in sizes of 25 29 and 34 inches, and the model UB65 with ergonomic design, and LG also says that visitors of CES can see the Real 4K monitor (model 31MU95) as and the latest Color Prime monitor (model 27MB85). UM95 supports a variety of advanced connectivity options including Thunderbolt 2 technology that simultaneously supports high-definition and high-performance data devices through a single compact port. With the help of Thunderbolt 2 users can take advantage of transfer speeds up to 20 Gbps as well as view and edit the original 4K videos while making backups of the same file. The higher resolution and the use of multiple monitors are also possible with support for DisplayPort 1.2. The technology uses the same cables and connectors and works with existing computers and devices with support for Thunderbolt. More monitors UM95 can be daisy-chained together with the servers and other hardware. The monitor comes with calibration software True Color Finder for optimum color rendition, and is capable of providing 99 percent of the sRGB color palette. In terms of design LG’s new model includes a transparent base Crystal Float. LG IPS UltraWide 21:9 monitor offer and effective multitasking functions such as 4-Screen Split and Dual Link-up. Overall the series is compatible with Mac computers and supports HDMI and DisplayPort allowing users to mirroring and transfer content from a large number of devices.